Hi guys! 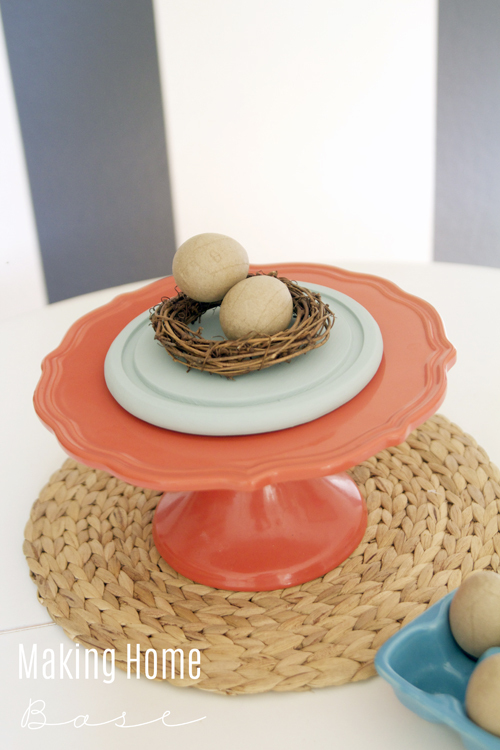 I’ve been working on a lot of SPRING decorating (and a ton of other projects). 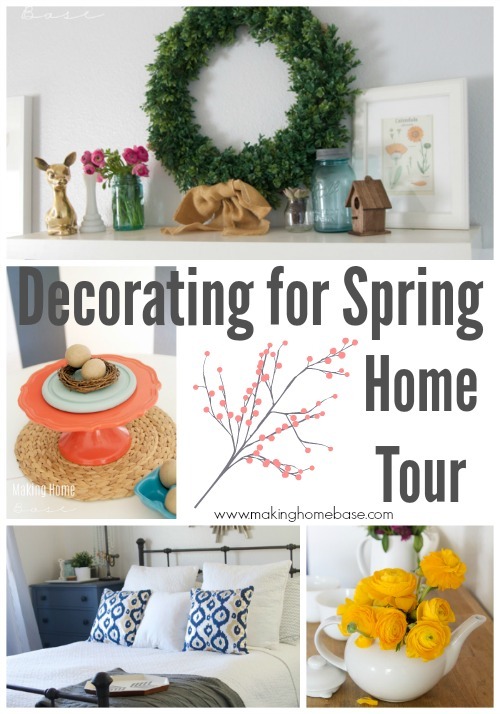 I’ve teamed up with 13 other home bloggers to bring you all beautiful spring home decorating ideas, inspiration, and just beautiful Spring Home Tours. 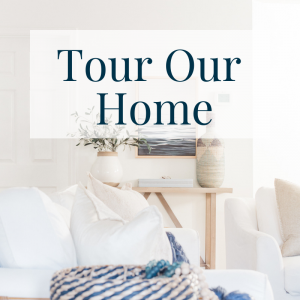 All week long, there will be home tours galore. It’s going to be amazing, I promise! 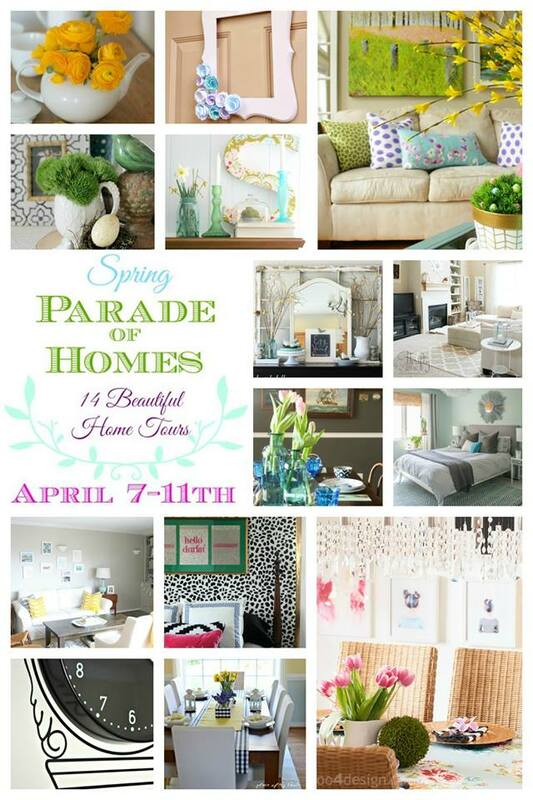 I’m thrilled to be kicking off the Spring Parade of Homes with my own little spring home tour! You guys know that we are a military family and we currently live in base housing. What that means is that our house is as basic as it comes. Decorating this space is definitely a challenge but we are doing a pretty good job at making it a home. 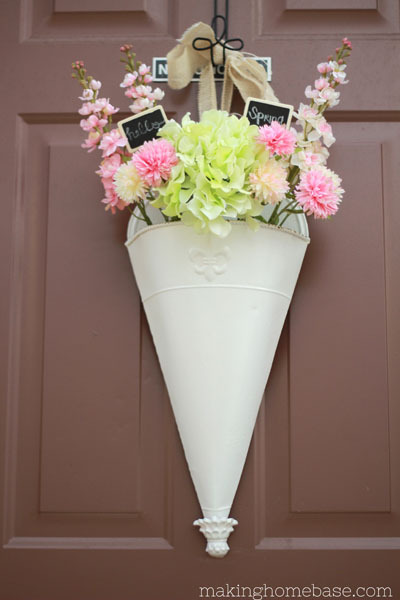 On the front door you’ll see this spring floral door hanging. It’s the same one from last year. Indeed. Spring, you’re my favorite! I wasn’t quite ready to put away my faux boxwood wreath so I brought it inside and hung it up above my faux mantel. 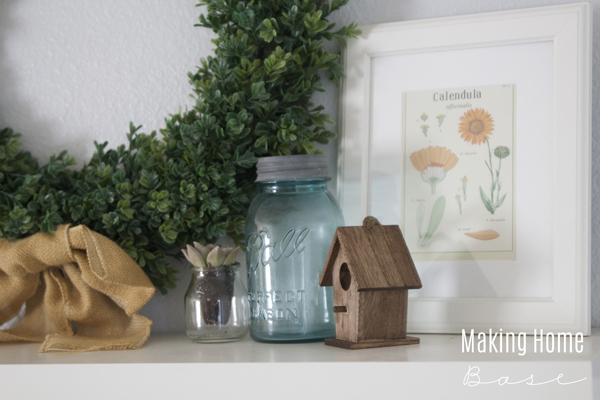 My mantel area is the first place that gets spruced up seasonally. 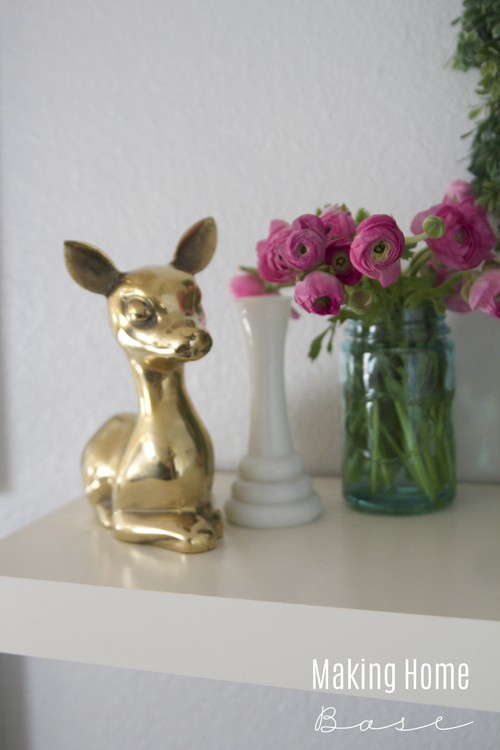 This little brass dear was a flea market find for my daughters room but I’m borrowing it for this spring mantel. It’s so cute! And my favorite thing about spring is fresh flowers. My favorites right now are fresh cut ranunculuses and these pink ones are the best. 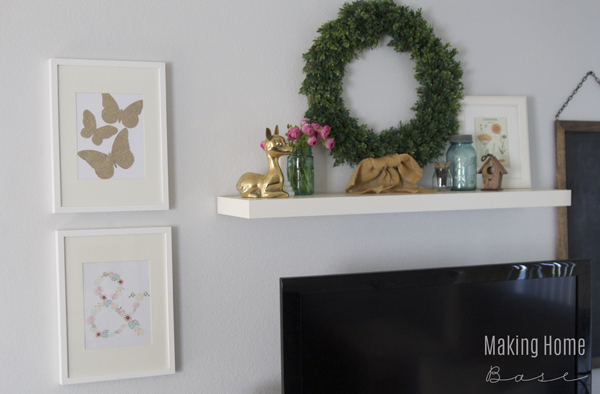 Next to the mantel I switched out the normal photos for some spring inspired wall art. I love the flower ampersand that I got from Etsy. 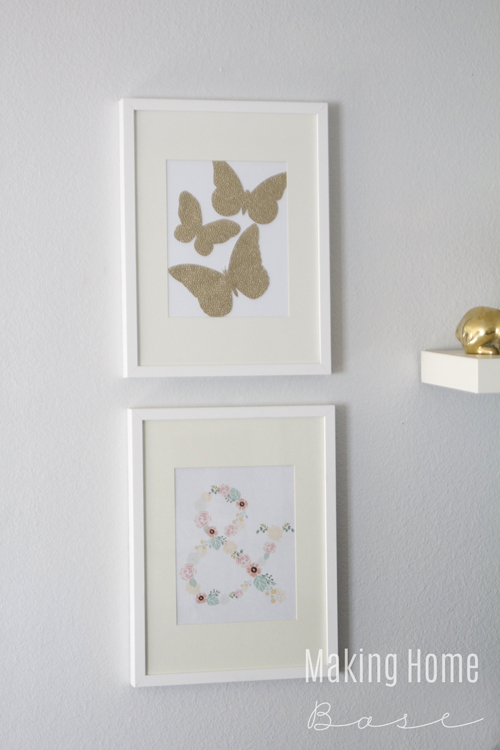 The butterfly art was a quick DIY I plan to share later this week. My dining room is still a work in progress so I’m only sharing a couple little glimpses. I love these paper mache eggs. I originally planned on painting them but I’m digging the rustic look so I’ll keep them as is. More flowers. 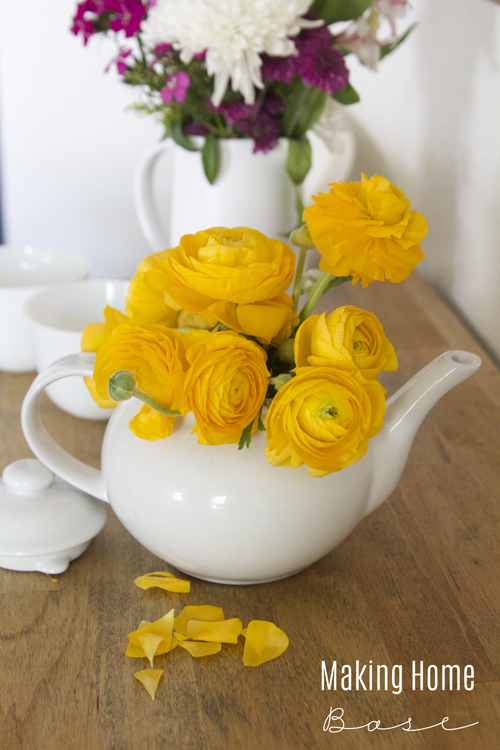 I put a bunch of yellow ranunculus in my white tea pot for a fun punch of color. 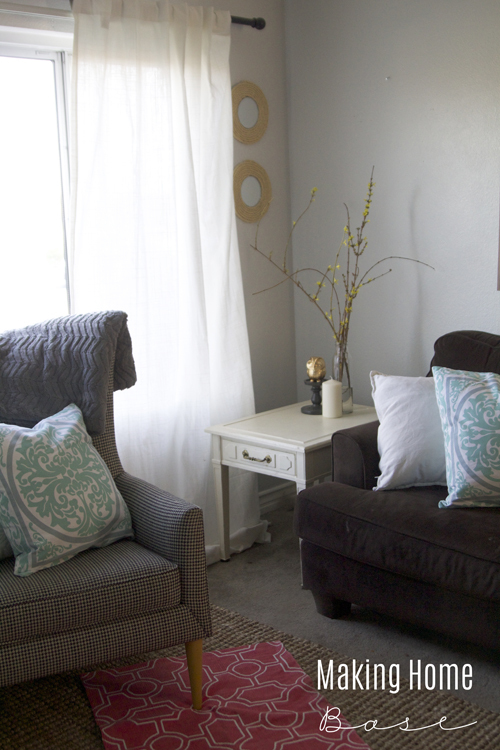 Pillows and blossoming branches bring a bit of spring into my living room. This is the room I struggle with the most. I’ve talked about it before. My sofa is so dark so I’m always trying to keep the pillows and accessories light and airy to counter the darkness of my sofa. I love these blue damask pillows I found at TJ Maxx. It’s just the perfect balance of light and bright for spring. And for a bit of bold, I layered this coral accent rug overtop my jute area rug. You know that I’ve been working on my master bedroom for awhile now. I’m so excited about how it’s coming together. It’s looking so light and bright. I’m really loving it. These pillows were a Target find from a few weeks ago. I love the navy and gold together. I’m still on the hunt for a bedskirt, the perfect rug, and a colorful throw. 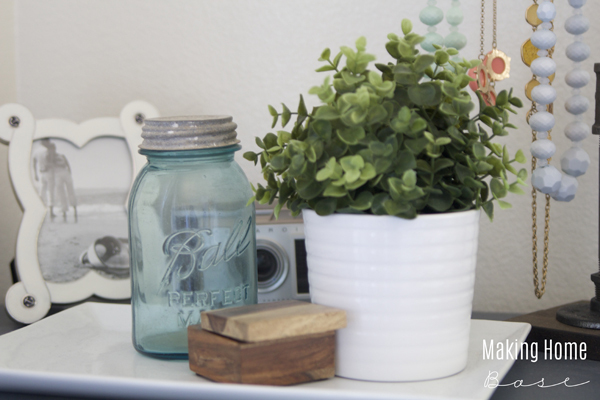 I have more greenery in the bedroom for a spring-y feel. 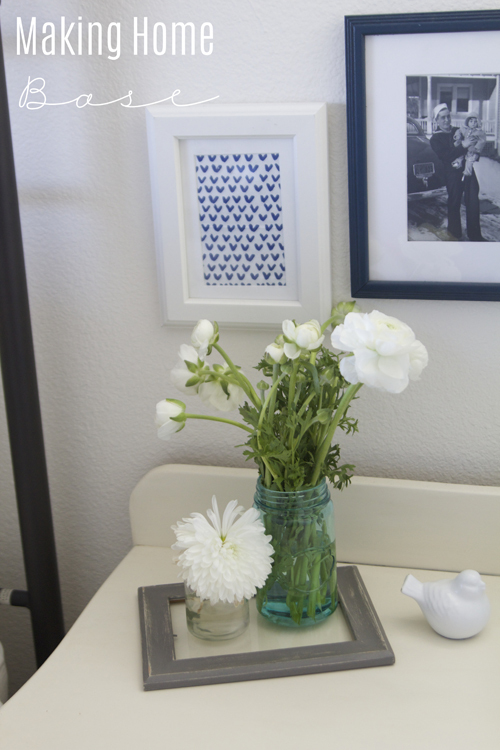 On our bedside table, there’s some more fresh flowers in a few jars placed on an empty photo frame tray. 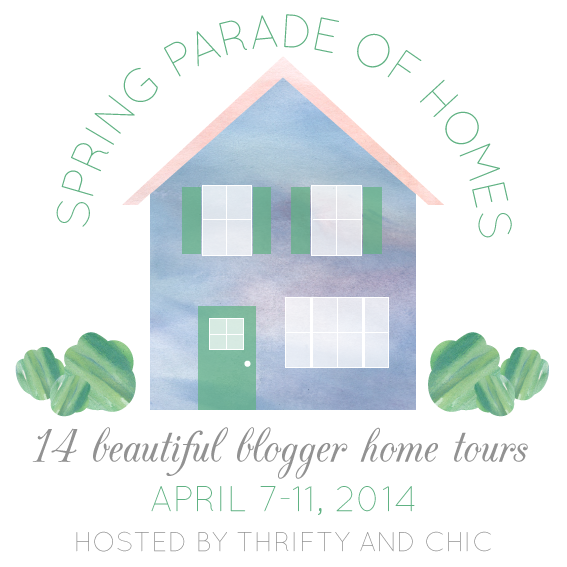 That’s it for my Spring Home Tour. 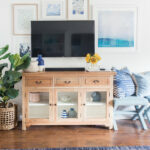 I hope you found some spring home decorating ideas here but that’s not all! There are two other beautiful homes to see today! And even more throughout the week! Everything is so so pretty. Love your gold deer A LOT! 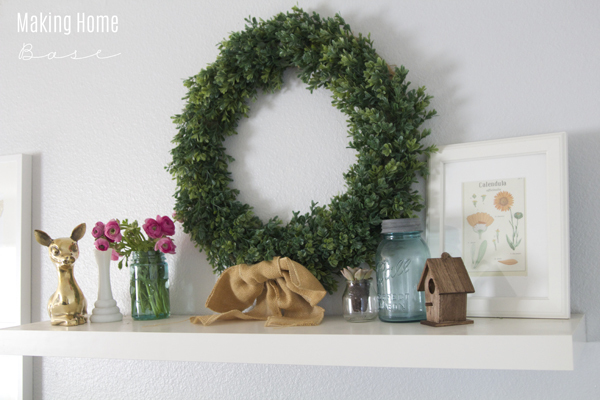 Love the front door wreath and the empty photo frame tray… so cute! 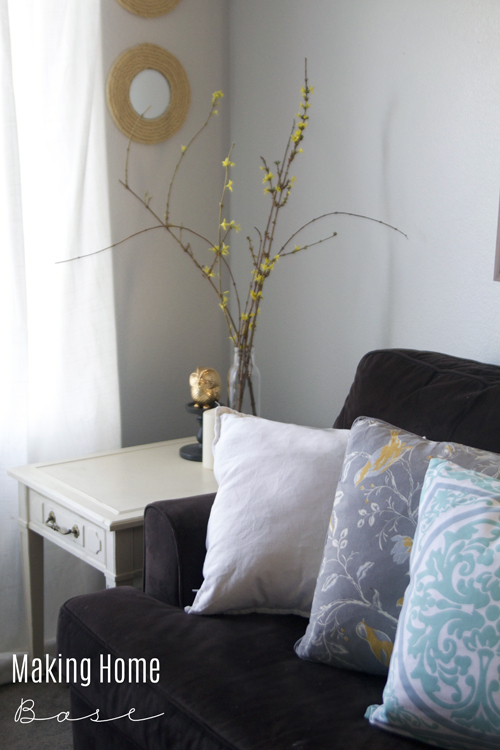 Great cheerful spring-ready spaces! Thanks for sharing with us. it looks so pretty! love the mantle and the brass deer! and i love your bedroom! 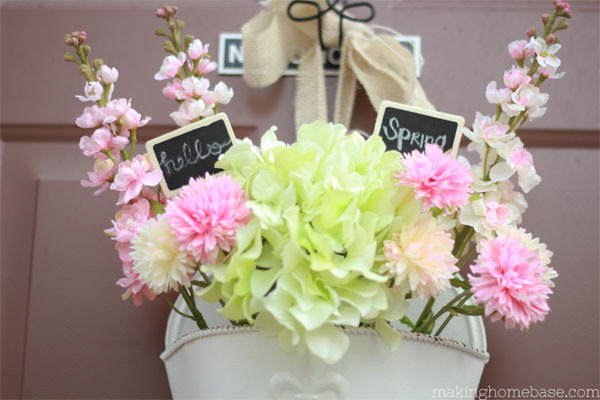 Your home is definitely ready for spring…so delightful! That flower ampersand is adorable. 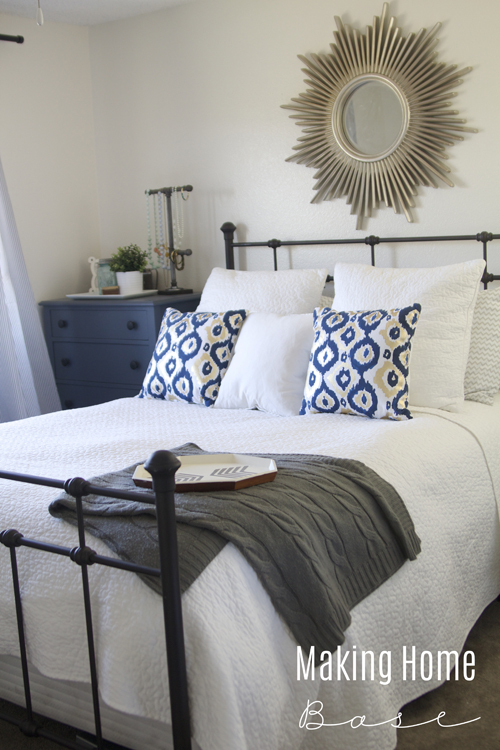 I think your doing just wonderful with your home on the base…love the blue and gold pillows from Target! Everything is so, so beautiful, Chelsea. 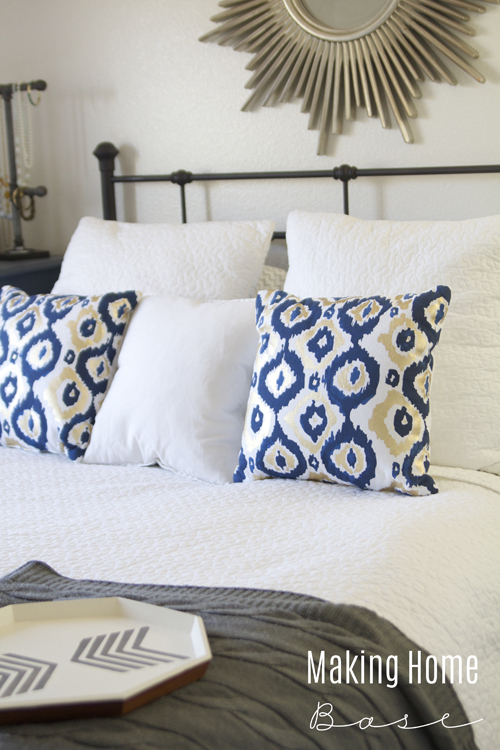 I LOVE those pillows you found at Target – they are perfect for your bedroom! 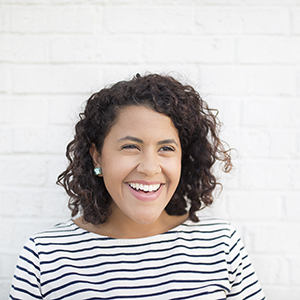 So many pretty touches and pops of color, Chelsea! 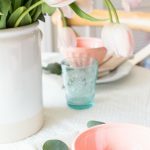 I love that coral stand on your dining room table! So pretty! cute spring art!! I love all your flowers. I don’t know a better way than fresh flowers to bring in spring!! Your home looks lovely!. I think the flower ampersand is my favorite touch. Looks great, Chelsea!! Love all the peeks into your pretty rooms! Very lovely decorating, Chelsea! I really love how you arranged your ranunculus in your tea pot.. Glad to be included in this tour with you!Have a great week! What a gorgeous, gorgeous home! 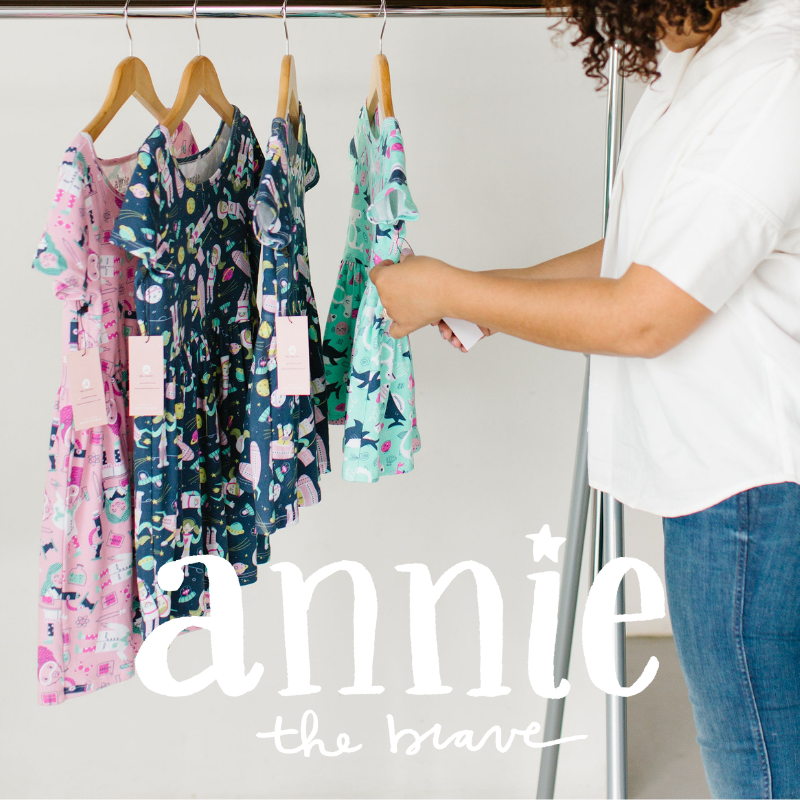 So spring-y and cheerful! And I am always jealous of your mad photography skills– such pretty pictures! 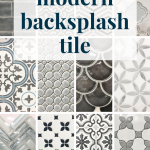 Thanks so much for giving us a peek into your space! 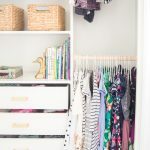 Im in love with every single thing you have in this post!! Your house is gorgeous and i love how you have used bright bold colors with fresh light backgrounds. Perfect for spring. I pinned almost all of your images because I liked each of the projects so much! 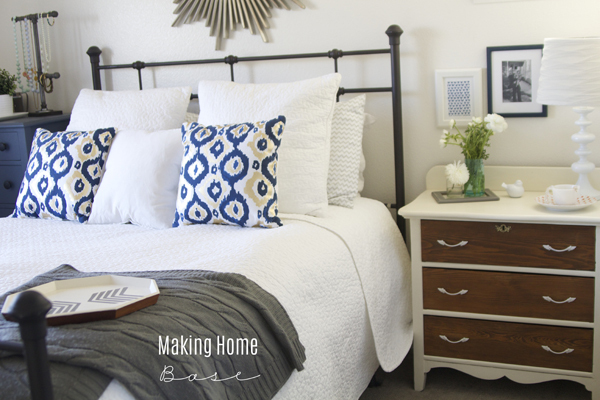 Such a beautiful home tour as always:):) LOVE your bedroom and that coral cake stand too! Great rooms! I also just replaced my heavier curtains with sheer curtains for spring! Everything looks so cheerful and welcoming, love the frond door! Chelsea, you have done a wonderful job making cookie cutter military housing a place you can call your own! I especially love the mirror above the bed and your use of vintage Ball jars. Happy Easter! or blog postts in this kind of space . Exploring in Yahoo I at last stumbled upon this site. forget this website and provides it a look regularly.